I've been getting my guest room ready for company this weekend which reminded me to tell you a couple of things that I've learned about laundry. Pluses: Easier to store, takes up less room. Minuses: I have to mix it with hot water prior to pouring it into the machine. Directions: I have a front-loading, HE machine and I use about two tablespoons per load (1/4 cup if the clothes are really filthy). I add 1/4 cup of white vinegar to the rinse cycle for whites to keep them bright. 4 cups grated Fels Naptha Soap (There are mixed reviews on this product. I've read their website and am comfortable using the reformulated version that they now produce. Again, do what you feel comfortable doing and I'd omit this if you have really sensitive skin). * You can also add 10 drops of essential oil to this if you like. I don't because I live in a house full of men and I feel that the fragrance from the Zote and Fels is enough. If you do use oil, mix it in and allow 24 hours for the oil to be absorbed before using it and omit it if you have sensitive skin. For gym clothes, sports clothes and the clothes that I wear in the garden, I use the below. I keep a small container on hand. It can also be made into a paste for treating stains on whites. In both cases, mix with about a cup of really hot water, stir until dissolved, and pour into the machine. In order for the grated soap to dissolve, the water has to be really hot. If you have several loads to do, boil a couple of cups of water, put it into a big measuring cup and add soap powder per the above. Then, you can just pour in as needed. Actually more like a gel. In order to do this, you need to "cook" the ingredients. Here's how it's done. Boil 1 quart of water for every 2 cups of grated soap, (In my case, that's 1 gallon of water.) add grated soap, and stir until melted. I do this in my Grandma's enamel kettle. Once the grated soap has melted, add the powdered ingredients and stir well. Cover and let stand for 24 hours. Pour into a container with a spout. Shake or stir prior to every use. I use about 1/4 cup per load. It's glorious! It works in my HE machine using cold water and about a tablespoon and a half of the liquid per load. It rinses clean, leaves everything smelling wonderful for almost a week and in the nearly ten years that I've been using it, I've never had a stain or spot on any of my linens (including Thanksgiving tablecloths and napkins) that it didn't remove! Last on my list of "laundry obsessions" is ironed sheets. Yes, I know, I'm nuts. I grew up with a grandmother who taught us to iron by "allowing" us to press cotton hankies, my grandfather's t-shirts, boxers and, when we got "good at it", embroidered cotton pillow cases. To this day, there's nothing quite like the feel of freshly ironed, 100% cotton, sheets. Pressed sheets is something that I've always done for myself. It was a chore, but I still did it. Until a year ago when I "met" The Pioneer Woman, Rhee. She lives on a ranch. She writes a blog. She often changes up to TEN beds a week. She taught me something that changed my life. I now refer to it as "PW-ing" my sheets. First, you need a good mattress pad so that none of the moisture from the sheets reaches your mattress. Wash the sheets, rinse them and spin until they are almost dry (You can also do this by putting them in the dryer for just a few minutes). The key is that you put them on the bed DAMP. First the fitted sheet. Pull and smooth it with your hands. Then, lay the flat sheet on top but don't tuck it in. Pull and smooth it with your hands. Put the pillowcases on top of that. Turn on the ceiling fan and walk away for 4 to 6 hours (if you don't have a fan, it may take longer). PW does hers overnight but she has a bunk house. After a couple of hours, the sheets are dry and nearly as smooth as if they had been ironed. No kidding! Try it!I was skeptical too! Yes, I'm STILL stripping wallpaper. Now, I have a steamer. It seems to work much more quickly and I am convinced that it will be AMAZING once I get the hang of it. After all, if my two friends used it to strip an entire Victorian house FULL of wallpaper, it MUST be good! However, my bedroom project is on hold for a week because my friend Ann and her son, Ruben are coming back to visit and to help me get a few things made to sell at my friend Polly's sale in March. At least this time we won't have to spend an entire day cleaning my studio before we get started! Less than 24 hours later....too soon for a "bedroom makeover update"? I had about 20 minutes of "spare time" this morning so I decided to see how difficult it was going to be to remove the wallpaper in the bedroom. I loosened one corner and, thanks to good prep, it came down in sheets...cleanly...without any problems. and I thought to myself, "Well....that was easy....This will take no time at all﻿....Maybe I'll start on the ceiling border." I started in one of the corners near the window. At least that's what the statistics show. I don't actually think that the statistics apply to me since I sleep, on average, about six hours a night but I decided that it was time to redecorate anyway. It's been 10 years since we built the house and that's the last time that this room was decorated. I can't believe it...TEN years! Every time I think to myself, "I can't believe it", all I need to do is look at my bed linens.The sheets and duvet have lasted for what I consider to be a very long time. However, it's now at the point that the sheets have gone beyond "soft and nicely broken in" to "down right thread bare and somewhat transparent" and the color in the duvet has worn well past the point of "attractive patina". If all of that weren't enough, my color palette has gone in a "lighter direction" and I'm returning to a more "feminine feel" for this room now that I don't need to choose a duvet cover that will allow for a 53 lb. yellow labrador retriever sleeping on top of it every night (she's decided that she's happier in the chair....the pillows shown on the chair in the prior photo have been removed) *wink*. I've been thinking about this project since before the holidays but didn't really want to undertake one more thing at the end of the year due to the constraints of my job, the holidays, and the fact that I'm no longer in my 20's (or 30's or...you get the idea) and I can't survive on less than 5 hours of sleep for extended periods of time and still function. This is the master bedroom. It has changed a little since this shot was taken three years ago, but not much. 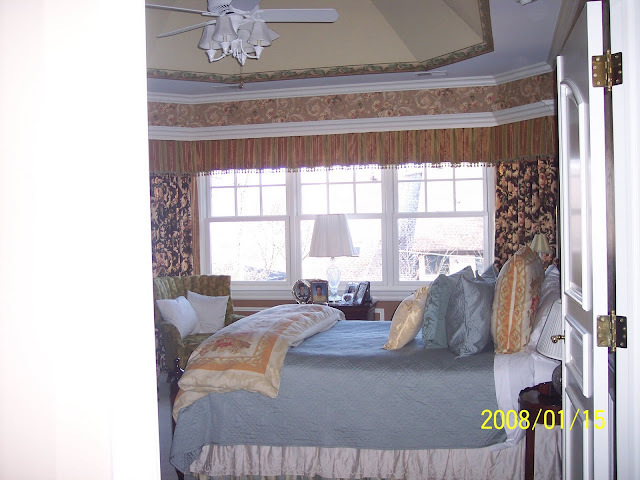 The wall behind the bed is wall papered in the same pattern that goes across the top of the windows. Things that you don't see: A large chest of drawers with an mirror, another arm chair, a lingerie chest and the set of double doors that lead into the room. This is a shot that was taken in the summer, four years ago. From this view, you get a better idea of how the ceiling looks and you can also see part of the hall leading to the master bathroom. What's not going to change? The ceiling fan/light fixture, the carpet, and anything beyond the walls of the "bedroom". (This includes the wallpaper in the hall leading to the bathroom). I'm also not painting the bed or either of the dressers. I am, however, in the market for a headboard/foot board for the guest room so a painted bed in this room is not out of the question. Most of the "budget" for this project will be spent on new bed linens and window treatments with additional money needed for paint and/or wallpaper. So I'll be in the "use what you have" mode for the majority of the remainder of this project. After having considered "white washing" the existing paper using a combination of glaze and paint, I've decided against it. This is mainly due to the fact that, in order to seal the paper well enough to create a surface that would allow me to wash on the glaze and not have it sucked into the paper before I got it evened out, I would have to varnish and/or seal the paper to the point that it would likely "become one with the underlying wallboard" which would seriously impair my ability to remove it the next time that I want to redecorate. I spent a couple of hours last Sunday afternoon looking through books at our local wallpaper store without success. Even if there's a miracle and I find something this weekend, I'll still be stripping wallpaper from the walls and removing the two rows of border from the ceiling. I'll be painting at least part of the walls and the ceiling. I'll be making and/or repurposing window treatments and buying and/or repurposing bed linens. I plan to paint at least a couple of pieces of furniture. Dependent upon everything else, I may even tackle some re-upholstery. Stay tuned. Oh, by the way, I expect this project to take a a couple of months. This is due to my job, my need for sleep, and the fact that I intend to celebrate Valentines day, St. Patrick's day and maybe even Easter before it's complete so, be patient. I'll post the "other projects" and give you updates on this one as it progresses. I may be cheating just a little bit because anyone who read my posts for 2011 knows that I ended more than one of them wishing everyone "enough". I don't often stop to consider the tools of my "trade" (nope, not those for my job in "corporate America", or my "jobs" as a wife, mother, gardner or home-keeper). I'm talking about the tools used for art and crafting. My bags, and boxes, and shelves of art and craft supplies along with countless books on various topics. The ones that reside (well, for the most part) in a single room in my house. There are scissors, Exacto knives, paint brushes and ink pens, thread, and glue guns. Some date back to grade school and some belonged to my Grandmother before me. Over the years, I've added tubes of paint, cans of adhesive, bottles of glue and glitter, scraps of leftover fabric, bolts and bolts of ribbon and more books. This collection of "stuff" allows me to pursue my passion. A passion that, at any moment, may change from wrapping a gift for a friend to sewing new drapes for my office, knitting a scarf or hand-pressing a clay tag....it's a part of who I "am". Don't worry, the photo below is the "before" photo from the marathon studio cleaning session, with my friend Ann, in November (if you're still unsure, read the post here: http://serendipity-kfj.blogspot.com/2011/11/when-is-half-hour-not-30-minutes.html ). One afternoon just over a month ago, my friend, Chris, phoned me. He is in the process of cleaning out his parents' home to make it ready for sale. He mentioned that he would be "finding new homes" for his mom's art supplies and asked me if I was interested in any of them. REALLY?!?! Would I be INTERESTED in ANY of them?!?! COMEON!!!!! I'm sure that not a single one of you who knows me or who is an artisan and/or crafter has any doubt about my answer, nor, I suspect, did my friend who is a guy that I've worked with and that I've known for more than 25 years. We go WAYYY back. Back to when I was young and single (oh wait, that's a DIFFERENT story). This week, I met Chris to bring the supplies to their new "home" in my studio. I didn't know Chris' mom but I did know that she had been an AMAZING seamstress, quilter and oil painter. It didn't surprise me when he told me that she had a "studio" in her home. Nor did it surprise me when he told me that she had done floral arranging, water colors, ink drawings and that she had also knit and crocheted (I'm somehow comforted to know that at least ONE more person besides me did "a little bit of everything" art and craft related). What did surprise me was the depth and variety of her collection of patterns and supplies. How amazingly well cared for and organized they were. I sat on the floor of her studio for a couple of hours looking through a six foot tall shelf that was filled with books and the single-most comprehensive collection of quilting patterns that I have ever seen. I never even got to the second set of shelves. There was also paper, and paint, and ribbon. Boxes of fabric and patterns, all sorted and labeled. They were mine to look through, mine for the taking. At some point, as I looked around me, as I opened boxes and made stacks of books, I was That, for me, was a humbling moment. The magnitude of the gift; not only from my friend, but from another artist. These were supplies from her lifetime, her passions. These were the tools of her "trade". Not those of her life as a wife, mother, grandmother, homemaker or any of the other things that she did so well, but of her life as an artist and a crafter. My car was filled and I'll need to make another trip to get everything home. Hugs were exchanged, thanks were given and I drove home, surrounded by reminders of the talents of a woman whom I'd never met. ﻿I've spent the last two days integrating her supplies into my studio. As her paints take up residence with mine and her books find space on my shelves, I realize that once combined, they make a new set of tools and that I have the benefit of what she learned and explored to draw from as I go forward on this journey. I've also realized that, for most artists and crafter's, it's the "sharing" part of the creative process that's the "best" part. I fully intend to keep creating and sharing, using my new cache of "treasures" and honoring her memory. I hope that some day, a long time from now, I'll enable another "artist" to do the same. Materials: Heart wreath form﻿, 1/2 yard of wide felt cut into 3 inch circles, ribbon in the same color as your felt, straight pins. 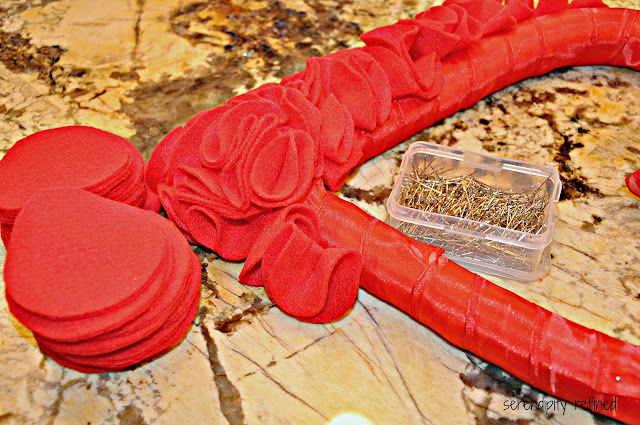 Wrap the wreath form with the ribbon, fold the circles into quarters and pin them to the form...that's it! I love working with felt!!!! 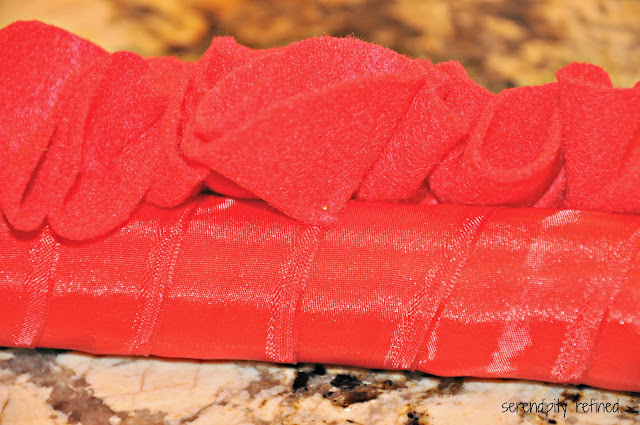 It is pretty inexpensive, doesn't fray when you cut it, and it comes in fabulous colors! I used the least expensive felt at JoAnn's Fabric and had a 50% off coupon. I think that I ended up paying about $2.50 per yard for 72 inch wide felt. These pillows above are a combination of hand stitching and machine stitching but there's absolutely no reason that they could not have been done entirely by hand or using hot glue and/or spray adhesive. I decided to stitch mine since I hope to use them for a couple of years. I downloaded the pattern for the Cherub and made up the rest of the patterns as I went along. I have a sewing machine that embroiders which I used to embroider the word "Love" on the cherub pillow and the "Be Mine" on the heart pillow. You could hand embroider or even use fabric paint for these. I'm currently working on the family room mantel. Here's the ribbon and fabric garland that I'm using (it's easy to make. 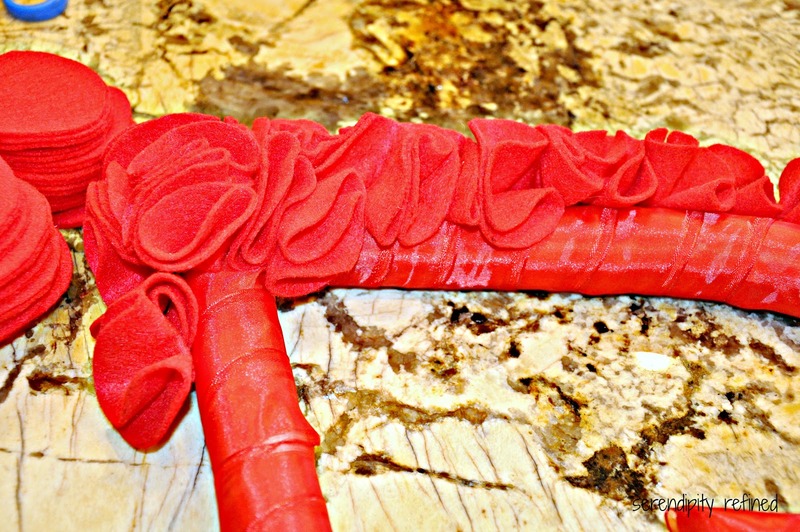 Cut cotton twine to the desired length leaving some on the ends to hang with. Cut 6 to 8 inch lengths of ribbon, felt, fabric, tulle, lace, or what ever else you have around (you may also want to add some hearts and wire "curls") tie the ribbons on the twine and, viola!, "almost instant" garland! ﻿ I'm sorry that I've been "absent" for the last week or so. Between the crush of the holidays, the "after holiday clean-up" and a few other significant life events, I've been "showing love" to those that I love. Not that I don't love this blog and all of those of you who take the time to read it, but sometimes other things take precedent. I hope that you understand. had some time to spend doing a little creating, a little shopping and a little decorating. I don't know about you but, after I finish putting the Christmas decorations away and giving everything a good cleaning, I always feel like my house looks a little empty and "unloved". While I'm always thankful to have the chore of packing the boxes behind me, I always feel a little sad when the ornaments and garlands are banished to storage for another year and it seems to me that my house does too. I got to visit with my friend, Diane Passi last week, we stopped at some shops in Geneva and I bought the wonderful wreath above from her while I was at her amazing home. Yesterday, I spent some time at Grayslake Flea Market with Laura from B&B's Nest and my friend Maureen. We were able to shop the booths of some of my very favorite vendors, Jeanine from Chippy Shabby, Jan from Gracie's Cottage, Diane Passi, Rhubarb Reign and I'm sure that I've left a couple of people off of the list but suffice it to say, it was a wonderful day! I'll show you pix of my new treasures this week! Last night, I made the cute, hot pink felt wreath shown here, on my mantel. (thanks, Diane, for telling me how to do it.) 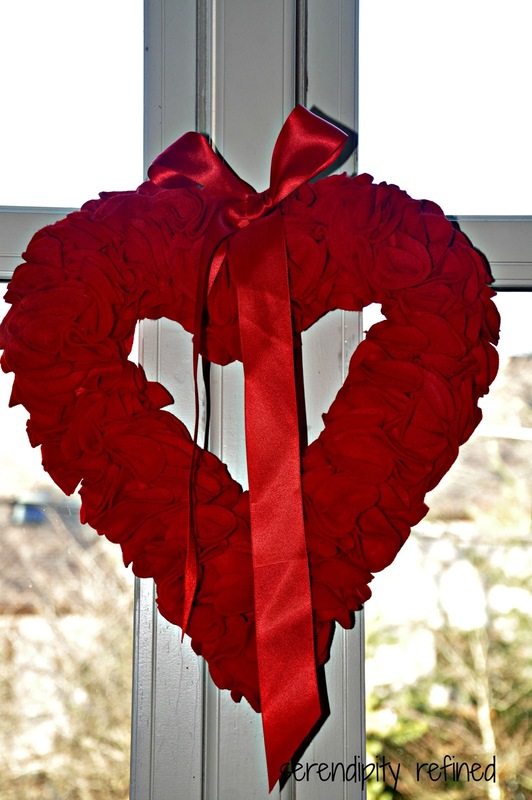 I used a Styrofoam heart ($3.99 less 40% with a coupon from Hobby Lobby). I wrapped it in some leftover ribbon that's the same color as the felt to help hide any Styrofoam that might show through between the felt circles. It took about 1/2 yard of hot pink felt cut into 3 inch circles (about 100 of them). Cut the circles then fold them in fourths and pin in place. Once the circles were traced and cut, it went really quickly and was so easy that I may make a red one for the family room or kitchen! Here's a shot of the chair in the living room and one of the chest that's currently in my foyer while the other one undergoes it's "transformation" now that I finally made it to Carter's Cottage in DeKalb to pick up my AS chalk paint! More this week. Have a glorious day!